“Get a purebred dog,” they said. “It’ll be healthier,” they said. It’s understandable that a person might want a particular breed of dog because they’re “#adorable” or known to be well behaved. What people don’t know is that keeping the breed pure can be harmful to the dogs’ health. 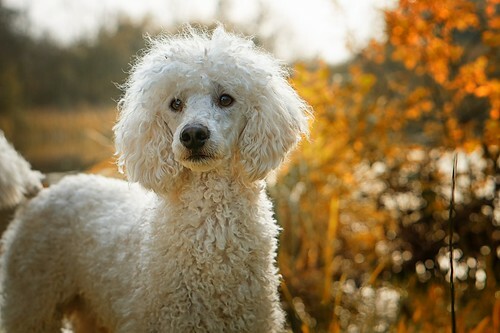 Purebred lines, such as today’s poodles, come from generations of selective breeding and inbreeding. Selective breeding is when you have many dogs, but you only breed the “best” ones so that their genes are passed down to future generations. This causes a genetic bottleneck, where the number of breeding individuals is quickly decreased. The bottleneck causes the next generations to become less and less diverse. Furthermore, breeders inbred the poodles. This made poodles even less diverse. Breeders were successful in enhancing the “good” traits they wanted, but they accidentally made some “bad” traits more common too. Recently, researchers have found a link between this genetic bottleneck and two genetic diseases found often in poodles: sebaceous adenitis and Addison’s disease . Sebaceous adenitis is a skin disease (Fig. 2). Affected dogs will be itchy, lose hair, have scaly patches, and have skin lesions. Dogs with sebaceous adenitis require lifelong treatment, with options ranging from special shampoos to oral supplements and other medications. Sebaceous adenitis does not kill affected dogs, but it causes them great discomfort. Unfortunately, some are even put down because their owners cannot afford the necessary treatments . Addison’s disease, also called hypocortisolism, is a hormonal disease. It can cause issues with the digestive system, nervous system, and especially the kidneys. Affected dogs can have a poor appetite, lack energy, vomit, lose weight, and have brain damage . It is difficult for veterinarians to diagnose, but patients have a good prognosis with proper treatment . Researchers used genetic tests on poodles to determine how diverse today’s poodles are. They compared purebred poodles to “village dogs,” stray dogs who can be considered the most diverse group of dogs. Researchers found that two randomly chosen poodles have DNA as similar as two sibling village dogs would . This means that purebred poodles have such little diversity, it’s almost as if they’re all from the same family! People understand that two human siblings should never have a baby together because there is a higher chance of the baby having genetic disorders. For purebred poodles, this risk is still there whether the parents are siblings or not. Researchers also found that 70% of the diversity is in 30% of the poodle population . In other words, 30% of the population is fairly diverse, while the other 70% of the population has very little diversity. So where do we go from here? Instead of focusing on producing show-winning dogs, breeders could work together to create a more diverse population of poodles. There’s a lot of potential in that 30% of poodles that is more diverse. By breeding them to the others (even if they don’t have show-winning traits), breeders could create a new, diverse generation. Breeders could also choose to breed their poodles to dogs of other breeds. Even though this wouldn’t keep the line pure, it would introduce some new genes and promote diversity. And where does that leave the rest of us? Never get a poodle? Probably not. But before buying any purebred dog, research what genetic conditions they are more likely to have. Have a conversation with your breeder to see if they are inbreeding or ever breeding unhealthy dogs. And keep in mind, the relationship you have with your dog will be a thousand times more important than a pedigree certificate. Monali Faldu is a senior at the University of Massachusetts Amherst studying Biology. 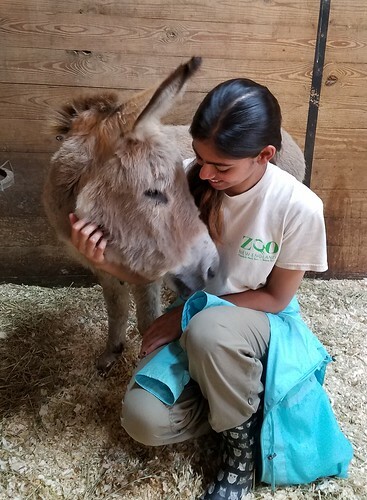 I’ve spent the past few years working hard as a UMass student, but also gaining practical experience working with animals. I’ve been fortunate enough to intern at multiple veterinary practices, work in a research lab with birds, and even intern at a zoo. This blog post stemmed from my honors research project, for which I am writing a series of articles about veterinary research, which are geared towards pre-veterinary students. It combines some of my favorite things: dogs, research, and veterinary medicine. After graduating, I will be working as a Veterinary Assistant and beginning to apply to veterinary school.